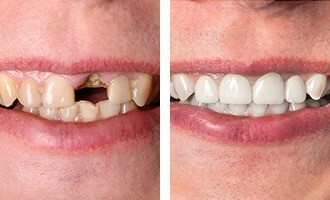 Choosing to restore your smile with a cosmetic or restorative dentistry service is a big decision. That’s why Drs. Dory and Khalida Stutman provide a special service known as PreNew PreView. With PreNew PreView, developed by master ceramist Jason J. Kim, we can show you what your smile will look like following your cosmetic or restorative transformation. But unlike similar services—which only give you a photograph to take home—PreNew PreView gives you a physical mockup you can wear over your existing smile. First, Dr. Stutman will propose a specific plan. Then, a photo of your smile and an impression of your teeth will be taken. That photo and impression, plus the details of your treatment, will be sent to the PreNew PreView lab. There, a realistic mockup will be handcrafted and sent back to our Massapequa dental office. Wearing your mockup, you’ll have a better sense of how your smile will look in the future. And if you want, you can even take a picture of your results with your smartphone to show your friends or family—talking to others is still an important part of the decision-making process. But we don’t think making a decision will be too difficult once Dr. Stutman has shown you what’s possible with PreNew PreView. No other service lets you see so clearly or dramatically the impact that cosmetic or restorative care can have on your sense of confidence and wellbeing. Don’t let uncertainty keep you from seeing into your smile’s future. Drs. Dory and Khalida Stutman of South Shore Dental Care are ready to help with Jason J. Kim’s revolutionary service. With PreNew PreView, you can trust that your mockup will accurately show you the personalized results you’ve been looking for. To get started, all you need to do is contact us today.